McDonalds Spoofs Hipster Coffee Culture in New McCafe Commercial from Sylvia G on Vimeo. In a straight-to-the-web special for the middle of October, John Oliver takes a crack at "egg nog for morning people." This latte art pushes the envelope, and then some. Via Neatorama. Do you like your chocolate with a caffeinated twist? Martha is baking me a cake that has two of my favourite ingredients: chocolate and coffee (espresso, to be exact). I came across this ad, produced a few years ago for the Italian manufacturer Zaini and its Kofli products. Coffee time, indeed. As seen here. 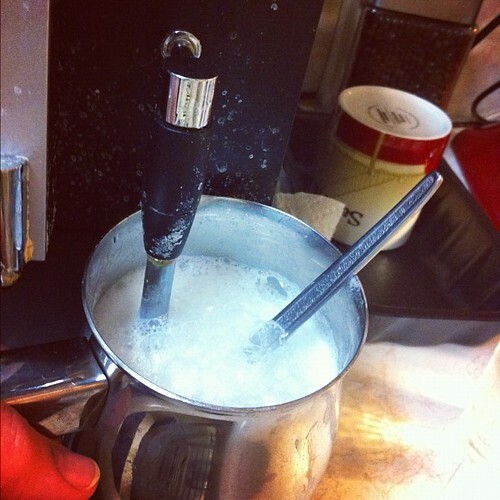 When you like coffee that much .. well, you know how it is. ... under my feet, every time I brew up a batch of coffee. These retro-minded ads were spotted on, of all things, I Love Retro. Because I will win. Don't even try. With bite, of course. Or bites ... there are two. A few years ago, Martha gave me the nickname of Coffee Minion, as - in the division of household labour that we've worked out over the last, um, 26 years or so - I make the coffee. (Rather well, I might add.) Here's the scene from this morning. 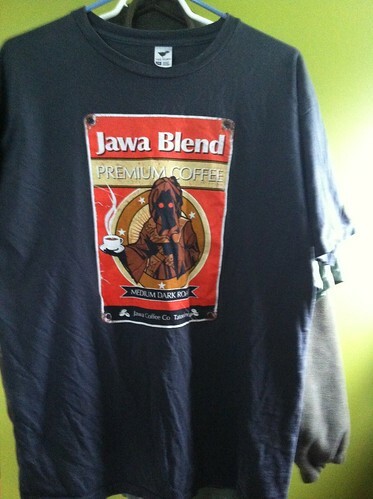 The name of this design on Threadless is, wait for it, Coffee Venndor. I saw this episode play out several days ago when I was in Toronto on business. 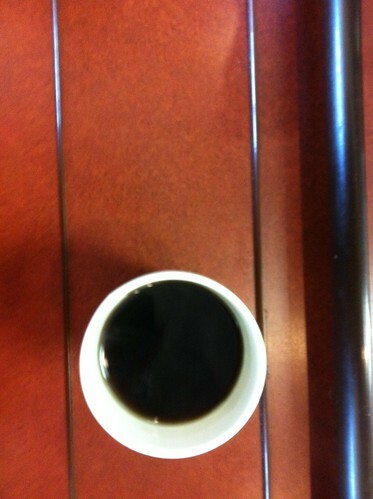 A young man in a business suit is ahead of me in the morning lineup at a busy coffee shop, ordering a latte. 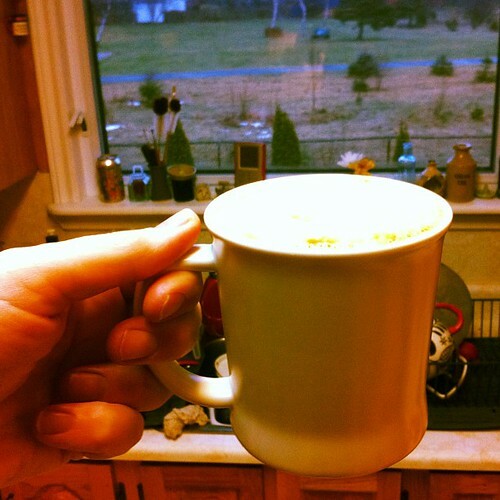 "I want a single shot of espresso, and then another shot, and then do that milk thing," he says. "Oh - you want a double," says the woman behind the counter. "Noooo," he says, "That's different. I want it to have two single shots, and then you can do that milk thing." The woman, who must have been struggling not to roll her eyes, says, "Of course." Later, while we were waiting for our orders, I notice she had circled the "double" box on the paper cup anyway. I could definitely have come up with this myself. I didn't, of course; I saw it here on Jon Rowe's Tumblr. Amusing, even if I have a tribal eye-roll over the Irish coffee joke. I love the eyes on the extra-shot one though! A snap of one of the coffee runs of late. Dave, who operates the canteen at the CBC building (a small business of one, but an appreciated one; he sustains us every weekday) is enjoying his vacation and hopefully decent weather. That's left those of us with coffee habits to wander out ... and for me, it's an excuse to a) get some air and exercise and b) clear my head. Nice things, but I can't wait for Dave to be back! I snapped this on Friday when I was on the way back to work, after picking up a coffee from the student centre at Memorial University. 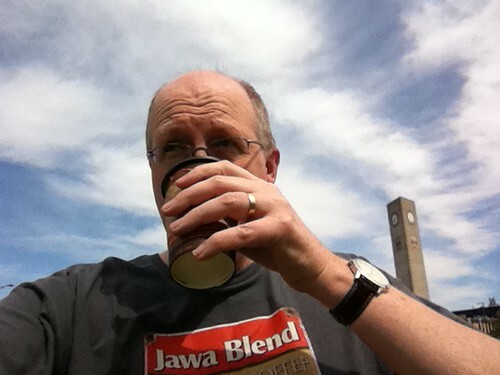 Note the coffee-themed T-shirt! As I've mentioned, we were in San Diego in June for a family vacation. A bit of a working one for Martha, as she had a conference to attend. Our home base was the hotel where the conference was held, just few dozen metres from San Diego's harbour. 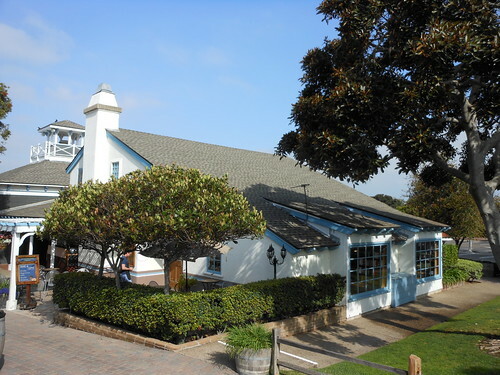 Nearby was a place called Seaport Village, a cluster of shops, restaurants, boutiques and atractions that seemed to cater largely to visitors, although I imagine a lot of the business also comes from the southern California area. Tucked in the area was a bookstore that became a hangout for us, partly because of the excellent coffee, partly because of the free wifi ... and definitely partly because it just felt comfortable. It's very much the kind of bookstore I'd love to see in St. John's. 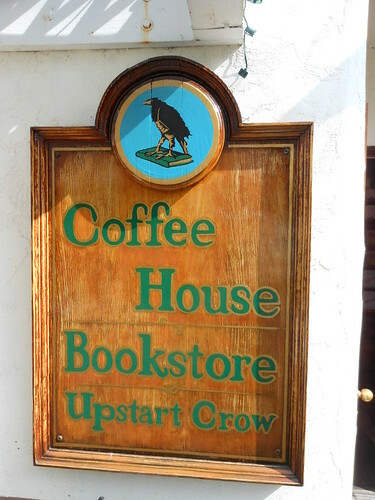 The Upstart Crow is in a building that seems like a cottage; if you didn't look at the surrounding buildings, you'd think you were in an English village. It's what's inside, though, that mattered. The Upstart Crow has a fair bit of room. It has two levels, although the upper one is more of a partial attic, holding some of the books. 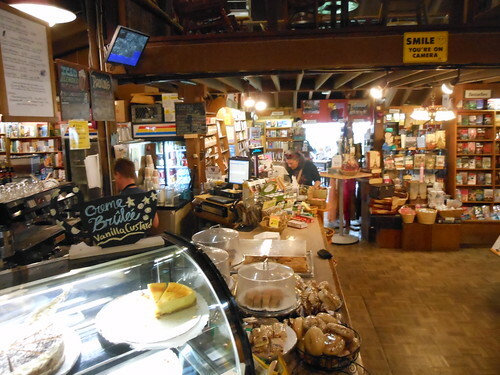 It serves a variety of foods to go along with the coffee, with a cafe inside. The seating area is obscured in the shot below by a section of the bookshelves. The selection of books wasn't particularly unusual; the pastries were not exemplary; the novelties and cards (a real profit centre of an independent bookstore, I'm guessing) can be found in other places. But it all came together. The store had a vibe. We wanted to go there, just to relax and unwind. Nick and I played checkers on a table while Martha browsed the books; we stretched our legs and read quietly at the end of the day; we stopped in for a caffeine hit before we set out on the day's adventure. We never once felt rushed when we tapped into the complimentary wifi to catch up on the news. And, yes, we spent a fair bit there over the week. It's something that's missing in the local retail scene. From TED, Steven Johnson telling us why coffee changes the world. There. Now, go have a second guilt-free cup! Hopefully it won't fling itself out of your cup. We dropped in to the newly opened Best Buy on Stavanager today, and braved the crowds. 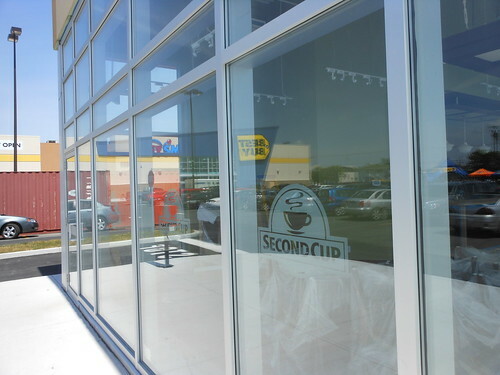 I went up to the nearby tiny box that will be a Second Cup drive-thru. I'm not that excited about yet another drive-thru, but it's not bad having another option for stopping for a coffee and a read. Nothing against 42; it's a lovely number. But caffeine has, over time, proved its worth to me in every way.